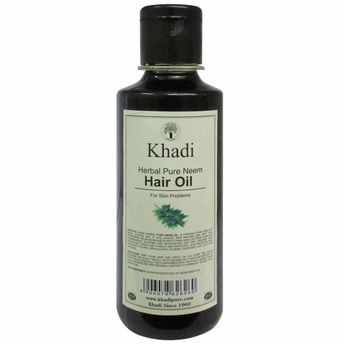 Khadi Pure Gramodyog Herbal Neem Oil, is pressed from seeds of neem, tea tree and it has unique skin healing and anti viral properties. It soothes and moisturizes dry and cracked skin and helps fight infection, fungus and parasites. It also helps in acne, dandruff, itching, skin allergy, eczema, psoriasis, lice, cuts and wounds.